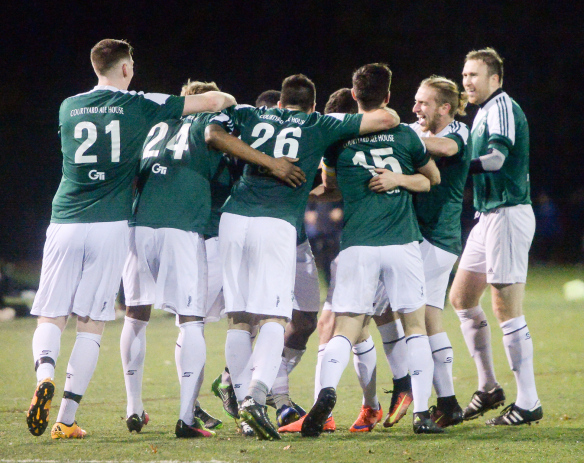 Shamrocks defeated Lansdowne Bhoys for the first time in the league in three years—seven matches—vanquishing them 3-1 in the season opener on Saturday night away from home at Tibbetts Brook Park Field 3. It only took the CSL two minutes to produce its first goal of the season and it was Kevin Grogan’s men who had the pleasure of scoring it. New signing Mark Roche headed Dylan McCabe’s corner low and hard on frame, forcing Lansdowne keeper Abdoukarim ‘Kabo’ Danso to dive on his left to block the ball. But unfortunately for Danso he blocked the ball toward Kurt Cameron, who stayed composed and tapped a shot in the goal. Ex-Cedar Stars winger Sammy Gehman attempted to pull the Bhoys levelled in the fourth minute, curling a free-kick toward the lower left corner of the net but the Rocks keeper Stephen Skonieczny was quick to dive on his left to protect his side’s early lead. Shamrocks missed a crucial scoring chance six minutes in the second half as an unmarked Cameron skied Alejandro Fritz’s low cross over the bar. Fritz missed a similar goal scoring opportunity himself in the 63rd minute, steering McCabe’s cross far away from the net’s left post. After those two misses the Queens-based club took advantage of a rare mistake from Kabo in the goal to go up by two. The big keeper spilled McCabe’s corner in front of him; Shamrocks substitute Travis Blair was at the right place at the right time to drive the ball in the goal with his right. Blair found the net again in the 90th minute. 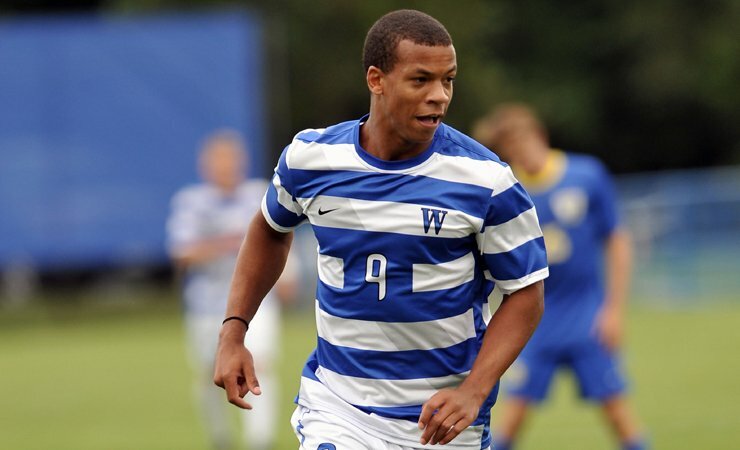 Nick Laurent spotted the former Wheaton College forward on a counter with a well placed through ball. Blair then charged into the left side of the box, dribbled away from Kabo before steering a low shot in an empty net from a tight angle. 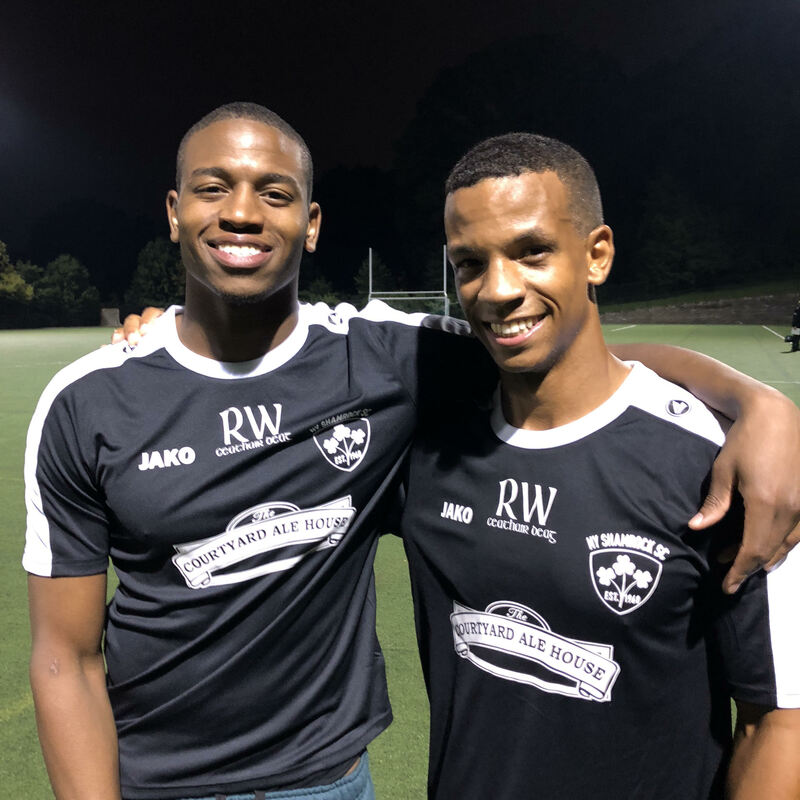 Lansdowne new signing Andre McFarlane scored perhaps the most exquisite goal of the encounter in a losing effort as he squeezed a low shot from about 25 yards out to the left corner of the net. Shamrocks missed the playoffs last season; forward Travis Blair was thrilled to start this campaign with a 3-1 victory over the champions after a strenuous offseason. However the 25-year-old expressed that he and his teammates aren’t getting ahead of themselves after this win as it was only the opener. “It’s the first game so you gotta keep that in mind but we’re very confident. We still have room to grow,” he said. Blair was delighted of his double coming off the bench. 1. The new signings weren’t shy: The new Rocks played a huge role in the win. Dylan McCabe’s free kick followed by Mark Roche's header started the first goal and former Zum Schneider F.C player Yannick Diese put up a solid performance in the middle of the pitch. New Bhoy Paul Wilson, a former USL playmaker, dictated Lansdowne’s game and took two shots, one of which was on frame. Lansdowne new Bhoy Andre McFarlane scored a voluptuous goal on his debut for the club. Another newcomer worth mentioning is Paul Wilson. The former USL playmaker dictated the Bhoys’ game and took two shots, one of which was on frame. 2. Unusual start for Lansdowne: The Bhoys never lost a CSL opener in the modern era of the league, which amounts up to six seasons. 3. Fouls on fouls on fouls: Well it was a Irish Derby. The two clubs exchanged 37 fouls, Shamrocks was guilty 22 times while Lansdowne returned the favor 15 times.